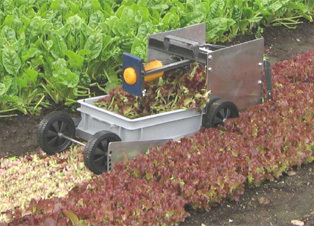 Harvesting is one of the most labour-intensive and important tasks of the garden year. For example, Corn Salad is usually cut by hand piece by piece because the customer wants clean-cut salad. If it is cut too deep, there are roots on the cut salad. If it is cut a little too high above the soil the leaves fall apart. This is why a bed for corn salad must be well prepared - most of all, it must be flat. And on a flat bed it is also possible to cut with motorised harvest equipment.